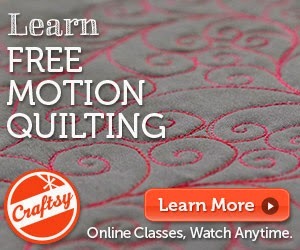 I teach how to quilt the ribbon candy and the leaves in one of my Craftsy classes -- link for 50% off retail. The bright yellow Hello Kitty purse completed my outfit. I will give this quilt away (to someone who has no idea that it's a Steeler quilt) and pack away my Terrible Towel and other Steeler garb until next season. Do any of you blend your sports and quilting passions? I love Blue & Silver and use those combinations a lot!! Go Dallas Cowboys!!! I follow Pat Sloan's blog and every time she posts a new quilt I just want to start. I've started the solstice quilt along, have all kinds of ideas floating around for the cobblestone quilt, and have the coin one printed off. I'm really trying to get my Splendid sampler quilt done before I start anything else though.